Not every company has the resources to bring in professional cleaners. But the reality is that resources have little influence when it comes to satisfying OHS regulations. The good news is that, with a little organization and a firm eye on standards, keeping your workplace spick and span is pretty straightforward. Just make sure your cleaning closet is properly stocked. In any case, taking an in-house approach does not have to be an overwhelming responsibility. All you need is a clear idea of the job at hand, a reliable cleaning schedule and a properly stocked supply of cleaning products that work. Like everything else, hiring professionals comes down to budget, and for most small and medium sized businesses, finding the cash can be a struggle. There are alternatives, of course. Here at Alsco, we offer affordable alternatives that suit a wide range of budgets with fully managed rental services for washrooms provided by Fresh & Clean. Taking on your own workplace cleaning brings with it some responsibility. When you hire professionals to do the job, you are entrusting certain obligations to them, like health and hygiene, maintenance and even safety. The terms of Occupational Health and Safety regulations include cleaning issues, and these have to be met. Bear in mind also that you are taking on general housekeeping responsibilities, with a need to neatly organize and secure away potentially hazardous objects, like boxes, books, furniture. Routes have to be kept clear for passing traffic and any unexpected spills have to be dealt with immediately to remove the risk of slipping. And of course, there is also the need to maintain supplies, to ensure equipment is available and in proper working order. And the storage area itself needs to be kept in clean order – so no putting chemical cleaner bottles on lumps of old rags, and or throwing boxes of toilet paper into the corner and thinking nothing more of it. These are important details, not just to make stocktaking easier, but to remove hazards from the cleaning closet itself – keeping your role safer. But what are the must-haves in your cupboard or closet? What products are needed for effective cleaning, and what equipment should you have at hand? We’ve put together lists of the items that are going to be needed if you are to maintain high hygiene standards that satisfy your staff as much as the OHS inspector. 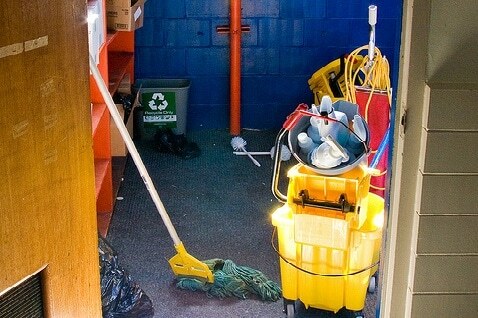 There are three important aspects to your workplace cleaning supply closet. First of all, it should have adequate space to house the store of cleaning consumables and supplies, and the equipment too. It is not a good idea to put cleaning products in one location and equipment in another. Think about it. It effectively doubles the chore. Secondly, the closet should be out of the way, and not facing onto a traffic route. You don’t need to create a safety hazard by choosing a closet that may cause injury to personnel, should the door swing open, or supplies tumble onto the floor. Of course, it should also be secure, locked and in good condition anyway. The third point is that the cleaning closet needs to be clearly identified with a sign on its door. You may be tempted to keep it discreet, but that is counterproductive – especially if you have a change of personnel who don’t know where things are. If there is an unexpected spill or toilet overflow that needs to be cleaned up immediately, then time should not be wasted looking for the necessary cleaning equipment and products. This can be divided into two separate aspects, but it all comes down to ensuring that the necessary supplies and cleaning products are in the designated storage space. In some ways, it is also where the hardest work lies, since both categories comprise items that are consumed, and therefore need to be replaced. So, some regular stock taking is going to be required. Cleaning Products – Often referred to as consumables, the range of cleaning products you include needs to be able to cover all of the workplace cleaning jobs, from floor cleaners to use when mopping to toilet roll for the workplace restroom. The precise list will depend on the premises you have, and on the particular work being done, but the general rule is that you have the cleaning products capable of doing the job in question. An essential product simply because of its versatility. It can clean a wide variety of surfaces, from office desktops and door handles to restroom sink tops and toilet seats. There are lots of multi-purpose chemical cleaners out there, all of which offer the “kills 99.99%” promise. But it is wise to go for one that also has disinfectant properties as they also target the other micro-organisms that can cause infection. You should be able to find one with nice odours too, like a mountain or ocean fresh or lemon or lime etc. This is basically the same as multipurpose cleaners but needs water added to it before it can be used. A common example is floor cleaner, which is diluted in warm water and then mopped across the lobby, corridor, restroom or office area, provided the surface can take wet conditions (tile, concrete, vinyl or linoleum). It’s important you know what works best on your floor surface – linoleum needs a gentler cleaning agent than vinyl, while tiles are not as tough as polished concrete. And in each case, the old-school bleach cleaner is not generally recommended for anything other than the filthiest places. The website HowToCleanStuff.net gives a pretty good breakdown of the best cleaning procedures for particular floor surfaces. If your office floor is covered in carpet tiles, then you will need the proper cleaning products and equipment (see below). Just like any living room, the fibres in an office carpet tile can be a haven for dust mites, allergens, emit air-quality damaging VOCs (Volatile Organic Compounds) and mould. There are a few chemical cleaner options, from dry powder cleaners (ideal for spot cleaning) to deep cleaning products, otherwise known as carpet shampoos. There is a lot involved in shampooing a carpet, with residual chemicals needing to be removed to avoid staining and re-soiling. It’s usually best to hire a professional for this. In truth, many of the multi-surface cleaners on the market are able to deal with the challenge of cleaning glass without leaving streaks. Glass is one of the dirtiest surfaces in a workplace, picking up dust, grit and bacteria, which can be easily spread via your fingertips. Try to use disinfectant cleaners for most hygienic results. Keeping your workplace restroom clean is essential if you are to ensure a healthy, hygienic working environment. The most effective chemical cleaners for the toilet bowl are tough, with bleach that kills bacteria and lifts hard-water stains off the ceramic surface. Keep in mind that all strong chemical cleaners can cause irritation to the skin, so rubber gloves should be used. And always follow the instructions carefully. These are very useful when it comes to staff doing a quick clean of their desk, computer and seat surfaces. The wipes are usually wet with disinfectant and are easy to use, with just a quick wipe over a surface required. As effective as they are, they offer great time-efficiency rather than perfect cleansing, and a thorough clean will be needed from time to time. Dry anti-static wipes are also useful in picking up dust and grit from desk phones and computer screens. An obvious element of any cleaning supply. Just make sure you have the right one (adequate thickness and absorbability) to get the necessary jobs done. These are needed for food preparation and consumption areas, but make sure they are strong. Thin-film sacks frequently rip. Also, if your workplace produces a specific type of waste (clinical or hazardous waste) then make sure you have the appropriately coloured sack. Have a selection of hard and soft scourers to tackle dirt and grime, and sponges to wipe down smooth surfaces. You’d be surprised how quickly this runs out, so keep close tabs and buy in bulk. A steady supply is needed if proper restroom hygiene is to be observed. Again, essential for keeping hands sanitized and hygienically clean, but have a bottle by the kitchen sink as well as the restroom sink. An essential team when it comes to properly cleaning floors, soft mop heads are best for the job in hand. Just be sure to wring the mop head out when finished, and to regularly replace the head to ensure maximum cleaning efficiency. Basic components in any cleaning closet, that are needed for quick sweep-up on hard floor surfaces. Remember, the broom head will need to be changed every 6 months or so to maintain effectiveness. For obvious reasons, a great help when you have done some scrubbing, but want to avoid getting too close to the toilet bowl. They might seem unnecessary, but they are protective equipment, and important when you have to deal with strong chemical cleaners and want to protect your hands. You’ll also need to protect yourself against infection when cleaning the restroom (especially the cubical and urinal) and if you need to clean up blood after an accident. A logical piece of equipment to have, especially when your office or workplace is carpeted. It’s not difficult to find a light vacuum cleaner for a relatively low price, but be sure that it’s got adequate power to properly clean the carpeted area. Signs denoting ‘caution: wet area’ are very important to have in your cleaning cupboard. It’s all to do with OHS, where the wet areas need to be sectioned off to prevent people slipping. You might also need stickers like ‘Hazardous Waste’ or ‘Recycle Plastics Here’ etc. to apply where and when it may be necessary. Like everything else, workplace cleaning should do everything it can to respect the environment. The good news is that there are plenty of eco-friendly cleaning products out there to choose from that offer an environmentally safe alternative without reducing the effectiveness of the clean. Recent reports suggest that even off-the-shelf anti-bacterial products are actually damaging to your health and the environment because they contain triclosan which has been found to accumulate in the food chain over time. At Alsco, our Fresh & Clean range of workplace washroom soaps and hygiene products are eco-friendly for exactly those reasons. Since you are handling chemical cleaning products, it is necessary to ensure you know how t deal with any mishaps involving them. Some chemical ingredients in these products can cause severe burning but almost all will cause some irritation at least to the skin or eyes. It’s the reason why manufacturers are obliged to provide Material Safety Data Sheets (MSDS). The problem is that even everyday house cleaning products can affect your health if they are mixed or come into contact with other products. So make sure you have the appropriate MSDS available in case of any mishaps. If you have decided to keep workplace cleaning in-house, then we know it comes down to what is practical and affordable for your business. One of the most challenging aspects of your decision is adhering to OHS hygiene standards. There is a lot involved – even if you do appoint someone to oversee everything. But with Alsco’s full range of managed services, the cost of maintaining OHS standards falls dramatically. Our range of rental services for all major industry types but, more importantly, can tailor our service to suit individual business needs and pockets. Trained and professional personnel restock consumable products and maintain rented equipment, so you can get on with running your business in full confidence. We don’t take care of all cleaning responsibilities, but we can certainly help to lighten your load, and we’re always available to provide advice. For more details on what we can do for you, simply click on the links to the services above, or contact Alsco by filling out an online enquiry form or calling us at the branch nearest you.